It's everyone's favourite this week at Pinspirational , Anything Goes ! 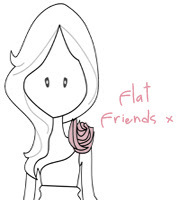 I used a digistamp kindly provided by one of our sponsors - Flat Friends . Please come over and join us at Pinspirational , where there are great prizes to be won. 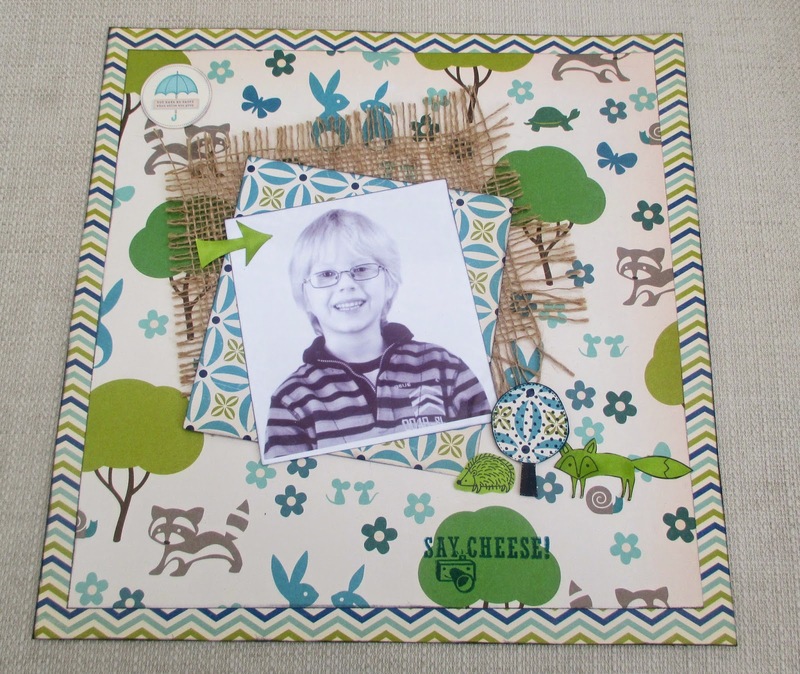 I was tagged for this Blog Hop by Kylie . I’ve had the pleasure of meeting Kylie in real life and she is just as friendly, kind and fun as she seems online. 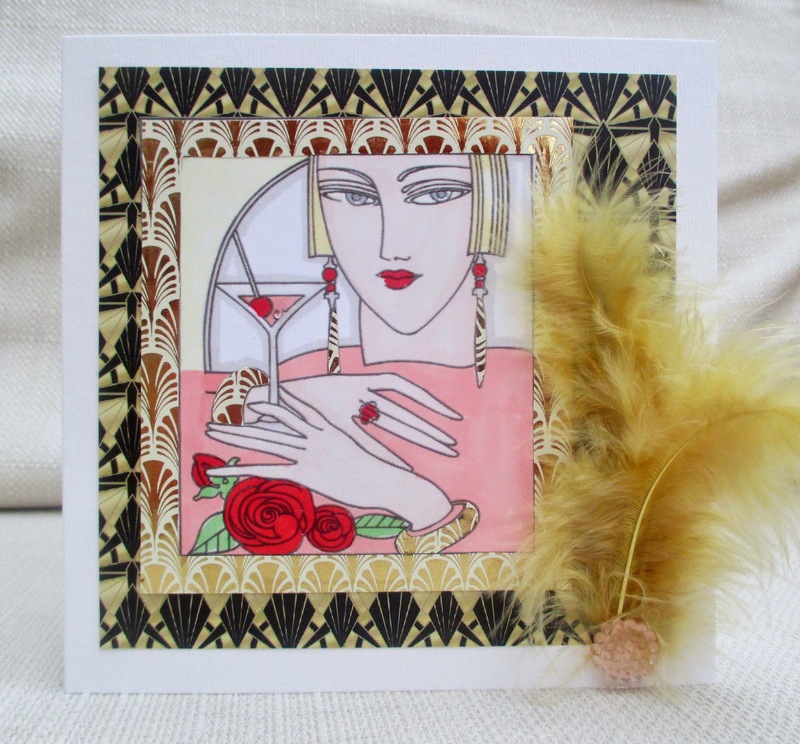 She also makes great cards, so go and check her blog. Okay, the idea is I answer the following questions. My main craft is cardmaking and , if I’m not making a card for a friend or relative, I am making cards for challenges- ones where I am on the DT AND ones that I just love the enter. 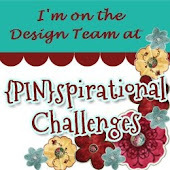 I’m on the Design Teams at Inkspirational, Pinspirational, Make My Monday and the Creative Cutting Challenge. I also have a regular feature on my blog called Festive 48, where I post a Christmas card a week and invite others to join me. I also enjoy scrapbooking (I am posting an example at the top of the post) and I go to a lovely local group once a month. I do like to make other things too, as long as they’re not too skilled! Recently I sewed some cushion covers and a cot blanket, and etched some glasses using a stencil. Finally, not exactly a creative project but I also volunteer at Paper Playful. 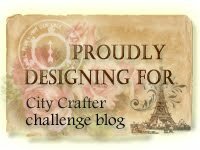 Mostly, I’m inspired by the person, occasion or challenge theme that I am making the item for. A card usually takes 30 minutes to two hours, excluding thinking and drying time . Most of the time (especially if it’s two hours) is taken up with correcting mistakes and looking for things! Coming up with an idea that I find interesting is the first stage of the process and then I just try to make it work, using whatever means necessary. 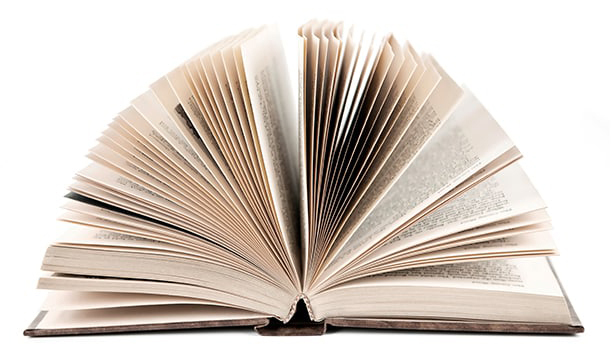 4.If you had to describe your 'signature' style, what would it be? Slightly wonky. I do like a stick on gem too. 5. What are 3 crafting products/tools you can't live without? 1) Computer with printer– I use it to type text, for digis and craft cds, link to my electronic die-cutter and to connect with other crafters. 2) Adhesives – I know it’s obvious but I’m always looking for the best and easiest. Currently I use fingerlift tape and zig glue pens. 3) Card blanks – I have trouble cutting straight so these save me a lot of time and trouble. At this point I’m supposed to tag in two crafters who I admire to be next in the Blog Hop. Well I did invite two talented and supportive crafters to join the blog hop…and they both declined as they felt it was not the sort of thing they enjoy! So I’m throwing out an invitation – if it’s the sort of thing YOU enjoy, please leave me a message in a comment and I will tag you in. 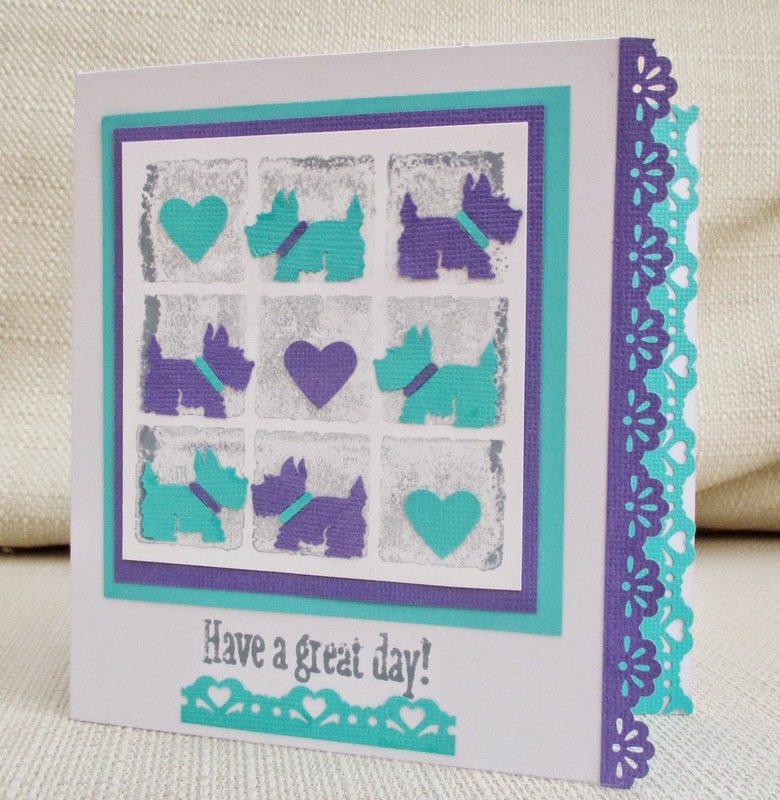 Our challenge this week at Make My Monday is die cuts / punches . As I have an electronic die-cutting machine (not to mention a Big Shot) , I use die-cuts all the time , so this time, I challenged myself just to use punches. I used four punches: the dog (Woodware), heart, and two borders. 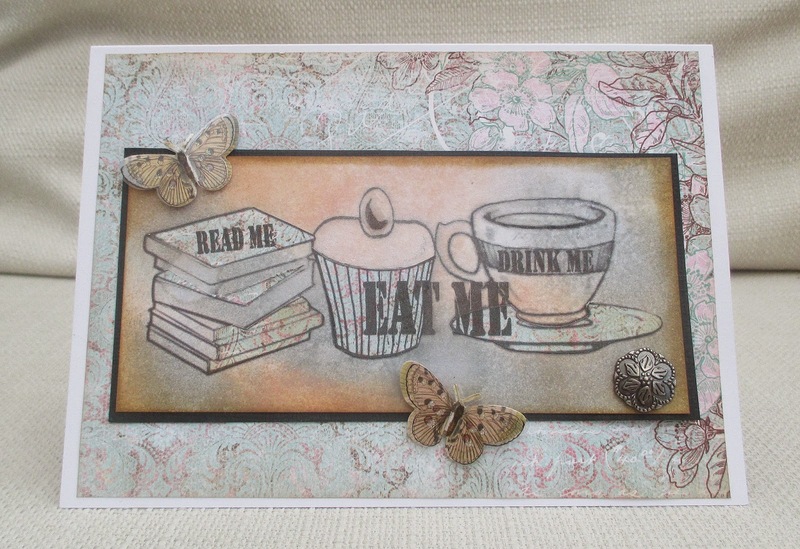 I also used a shadow stamp and a sentiment stamp. We'd love you to join in our challenge at Make My Monday. We have a cooking apple tree in the garden and, for zero effort all year round, it provides us with lovely apples every autumn. The perfect plant for the lazy gardener! Here I used a Rubber Stampede apple stamp, which I coloured with inks and water, and cut out. 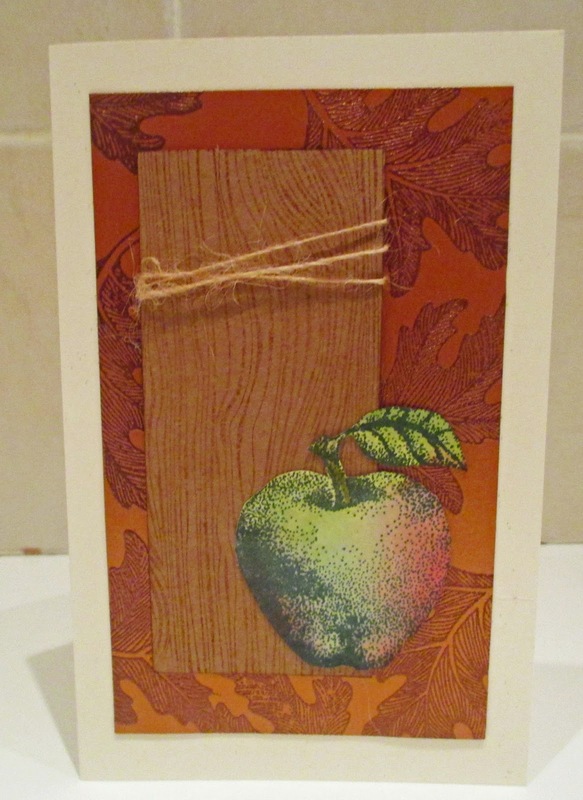 The woodgrain is a Hero Arts stamp and the background is a Stampin Up leaf stamp,heat embossed in copper on copper card. Although it appears lighter at the bottom, this is just the photo. Today, I spent a lovely day crafting with my dear Inkspirational team-mate, Sandie. She told me all about the challenge on her challenge blog Time Out . In honour of their DT member Bev, who has just had twins (congratulations!) , the challenge is to use two of something. And there's a fabulous prize! For my card I've used two die cut Christmas trees - not sure if you can see that the top halves are embossed in white pearl. The background is a Justrite stamp. The new Inkspirational Challenge is a 'designer's choice', chosen by Carol and it is - Beverages/ Drinks. For my DT card I found this picture in a book of copyright free images called Art Deco Designs, scanned it into my computer and printed it. I really enjoyed colouring it with Promarkers and paper-piecing with patterned foil paper. I highlighted the glass with glossy accents, glitter and a gem - but it doesn't show in the photo. 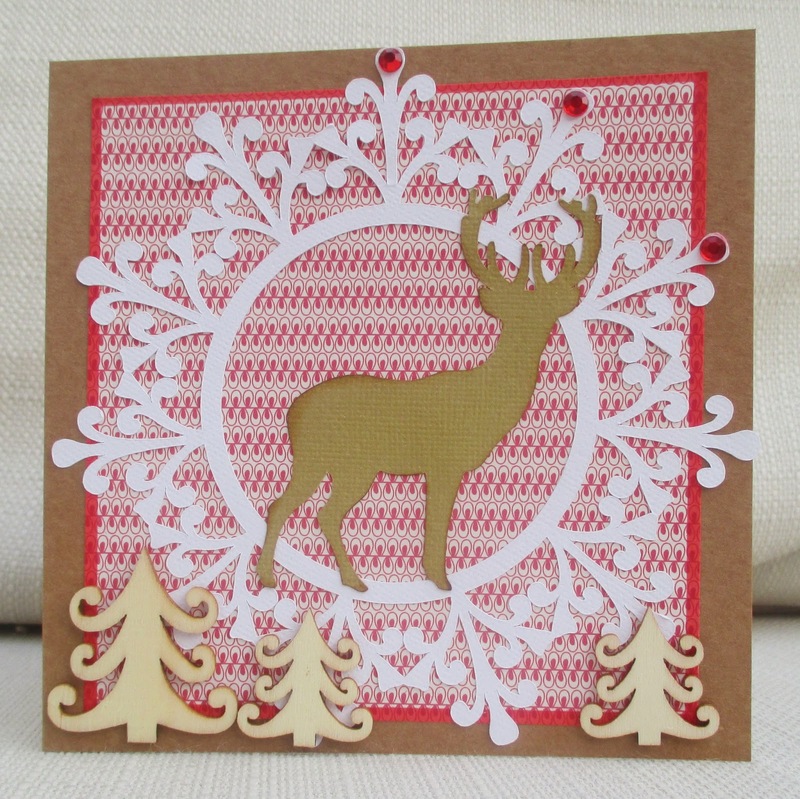 Come over to Inkspirational , see what the DT has done and meet our wonderful guest designer MaryV. Whether yours is a pint or a nice cup of tea, we hope you'll join the challenge. Is this a Christmas card? Certainly I thought I was making a Christmas card when I made it! For some reason I thought the stamp of the bird in the circles, a freebie with Craft Stamper magazine, was a Christmas stamp, but looking at it now there's not really anything Christmas about it , (and the CS DT's projects weren't Christmas either). 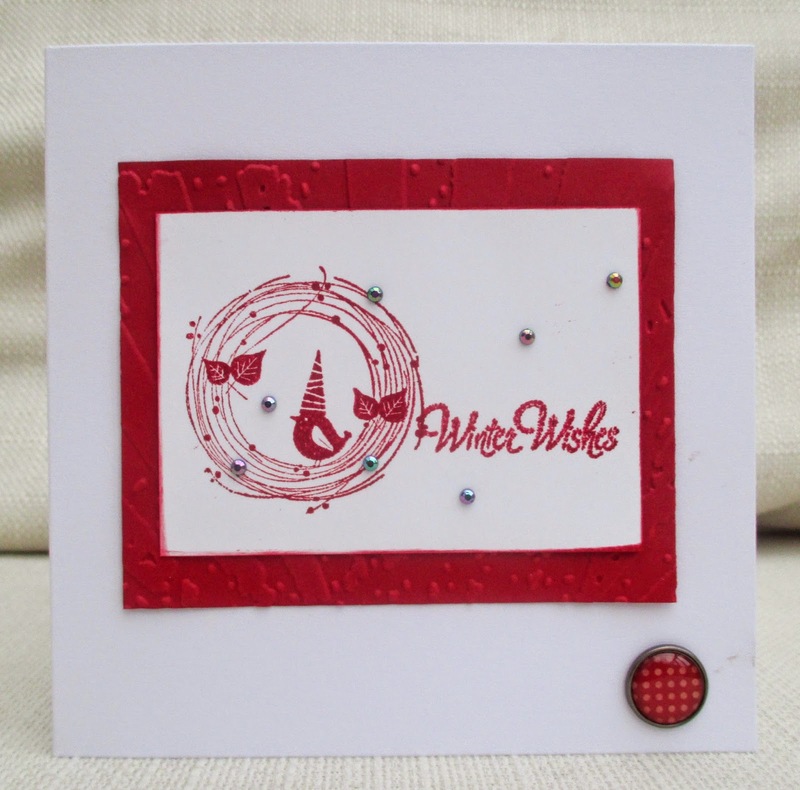 I stamped 'Winter Wishes' (part of a free set from another magazine) and added gems and a panel of embossed red card ( using a non- Christmas embossing folder!). So does it look Christmassy or will the recipient think I'm mad??? Here's my DT project for Creative Cutting Challenge - Fall. It's a shaker card, using Basic Grey Mellow collection (I've had this for years and still using it up) and, for the shaky bits, I used Creative Pointe 'fall leaves' SVG set, cut very small on the Silhouette Cameo. 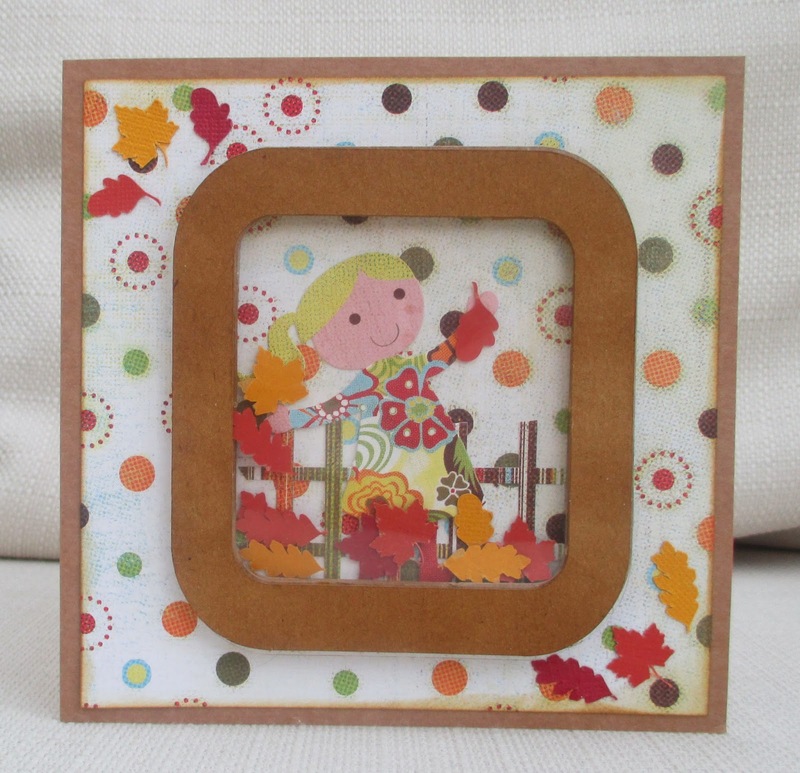 We'd love you to join our challenge at Creative Cutting - all you need to do is use an SVG or similar electronic cutting file, make an autumn themed project and tell us what you've used. See you there. 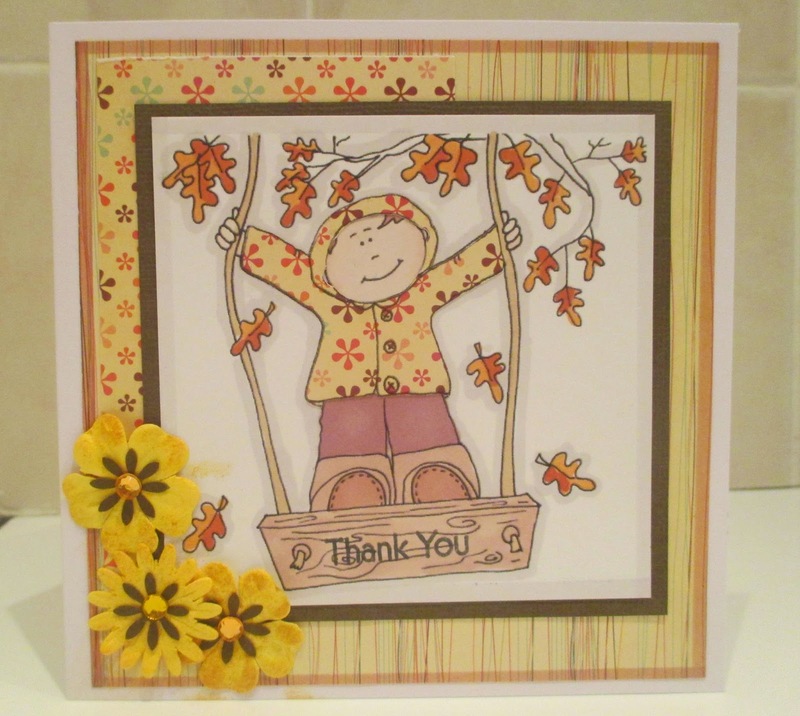 I was asked to make a 'thank you ' card for a childminder, so I thought I'd combine it with my DT project for Make My Monday , where the challenge is 'Autumn Colours'. I used a free digistamp from Dearie Dolls and I coloured it with Promarkers, paper-pieced the jacket, and stamped the sentiment on the swing. If, like me, you love the colours of autumn - reds, browns, orange and golden-yellow- I hope you will join us this week at Make My Monday. 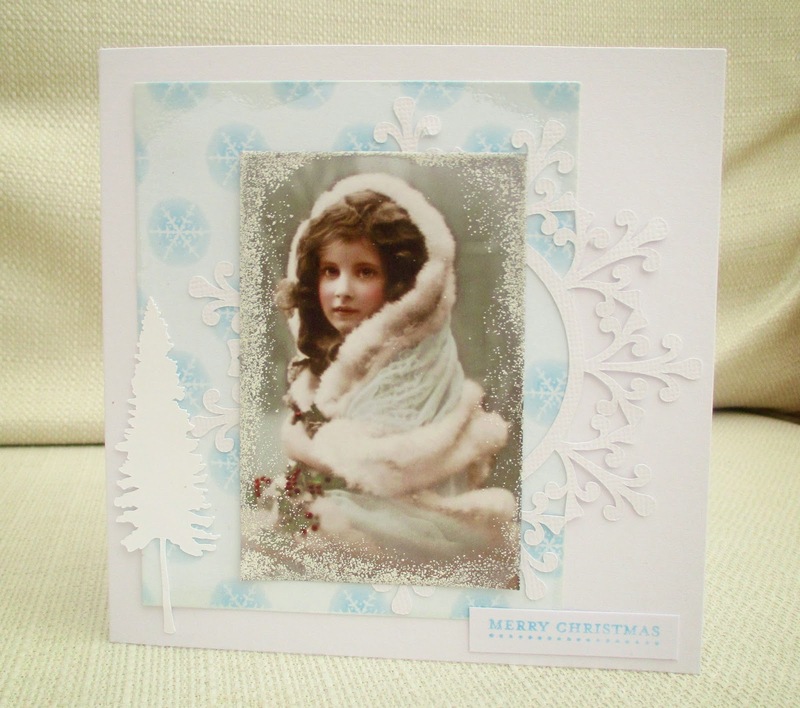 I often avoid challenges that demand a particular style (shabby chic, cas) for fear of getting it wrong but I couldn't resist trying the Nordic Christmas challenge at 52 Christmas Card Throwdown , so I hope I got the style right! The die cuts were cut on the Silhouette, the trees are wooden and the background paper was a magazine freebie. How do you photograph mirror card without your refection???!!! 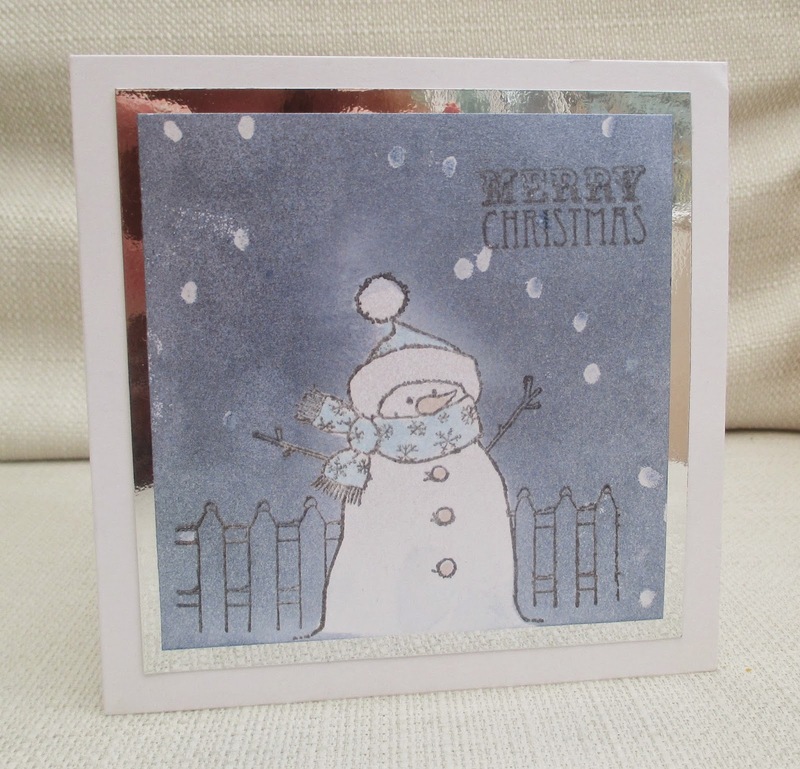 Two for the price of one this week for my Festive 48, using a Hobby Art snowman stamp. 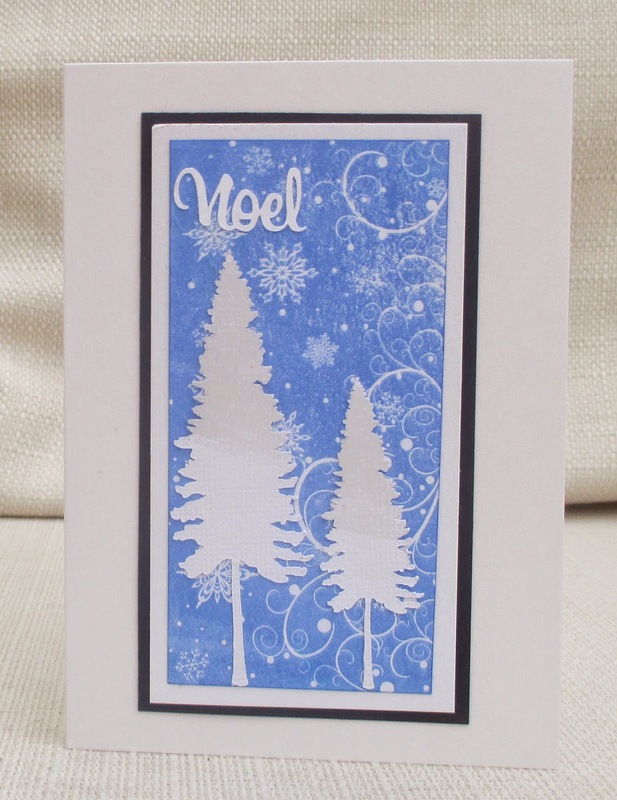 The first card is a one-layer card, using Promarkers and snowflake stamps. 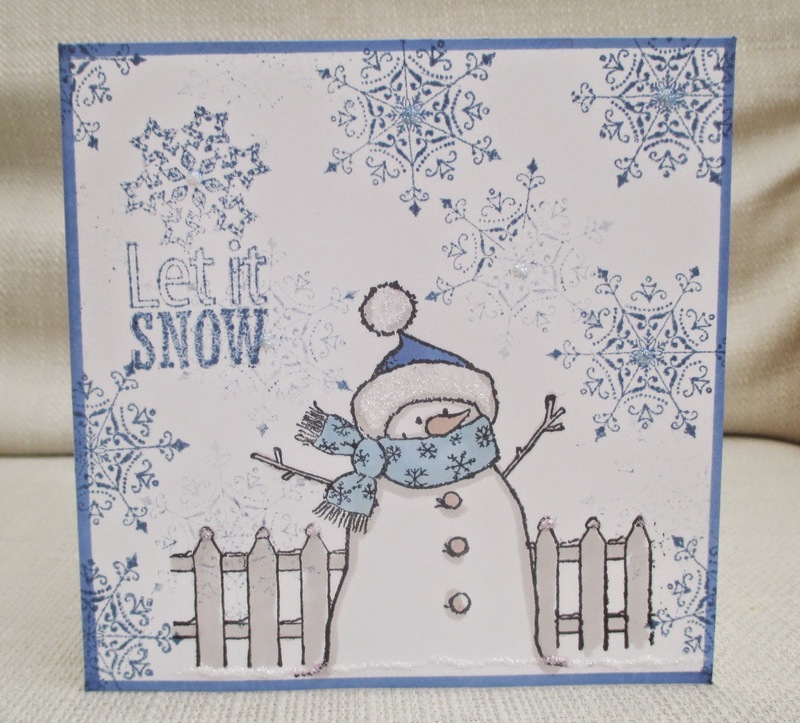 The second card uses masking for the snowman and resist embossing for the snow. This week's theme at Make My Monday was chosen by me, and it is - Tea and/ or Cake. For my card I was trying to get a sort of 'Alice in Wonderland' feel, without any actual ..er..Alice! 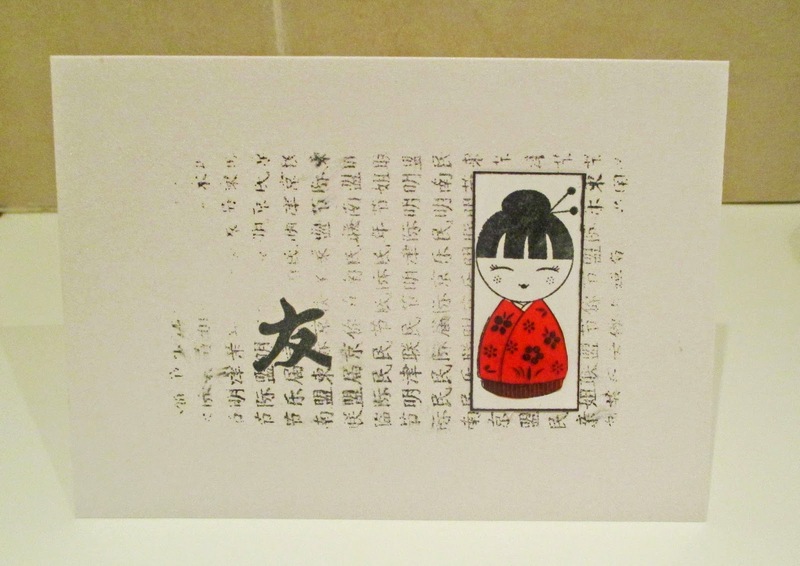 I composed my image using digistamps from My Craft Studio A Very Important Date CD and adding the text. After orinting, I coloured them by sponging distress inks and paper-piecing using the paper ( a magazine freebie) that I also used on the card base. I did add some Glossy Accents to the tea and the cherry, but they don't show in the photo. 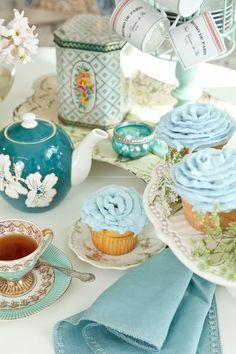 I hope you will make a project on the tea and cake theme, and join us at Make My Monday. My friend is having an operation next week, so I wanted to make a bright and cheerful card to send to her. 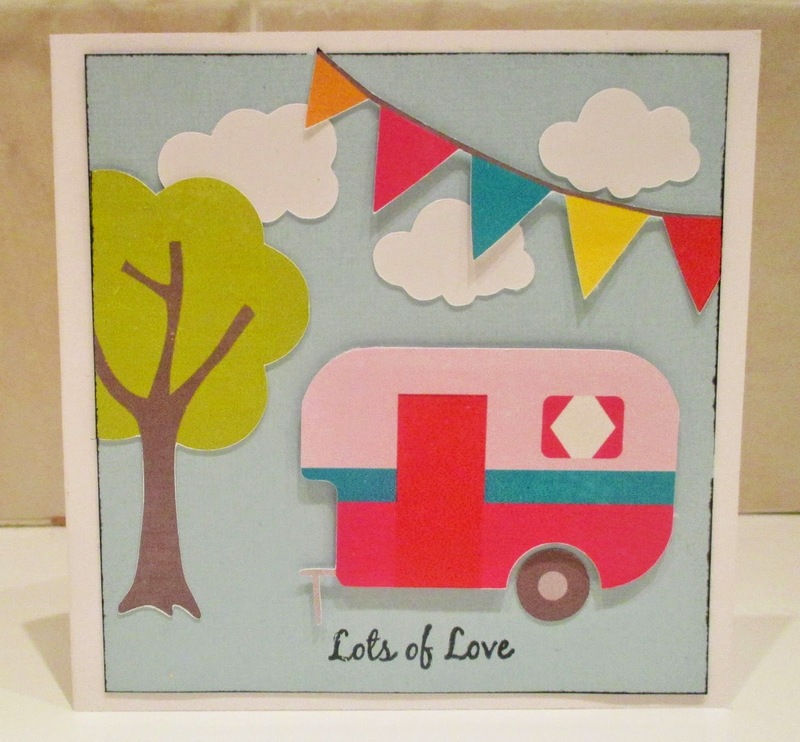 I spotted the caravan (trailer) picture inspiration at Scrapping for Fun over a week ago and thought that it’d be nice to use one of the cute caravan images I’ve got in digikits. All the images I used are from Lori Whitlock Summer Lovin digikit - I traced them in the Sillhouette (digital cutting machine) and 'print and cut' them. Then I stamped the sentiment- lots of love. 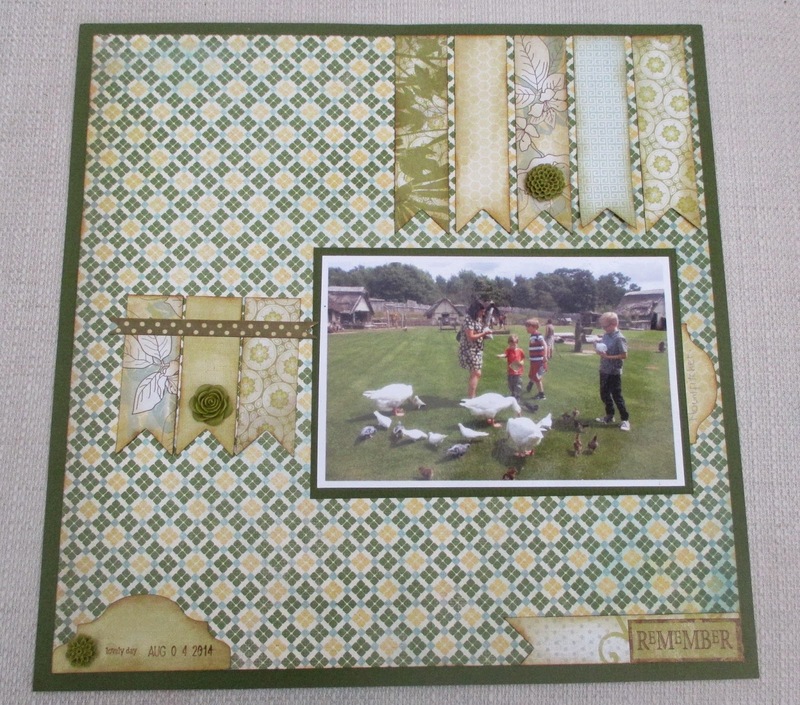 Also at the crop, we made a fabulous layout using Graphic 45 papers , and so I used the leftovers to make a card. 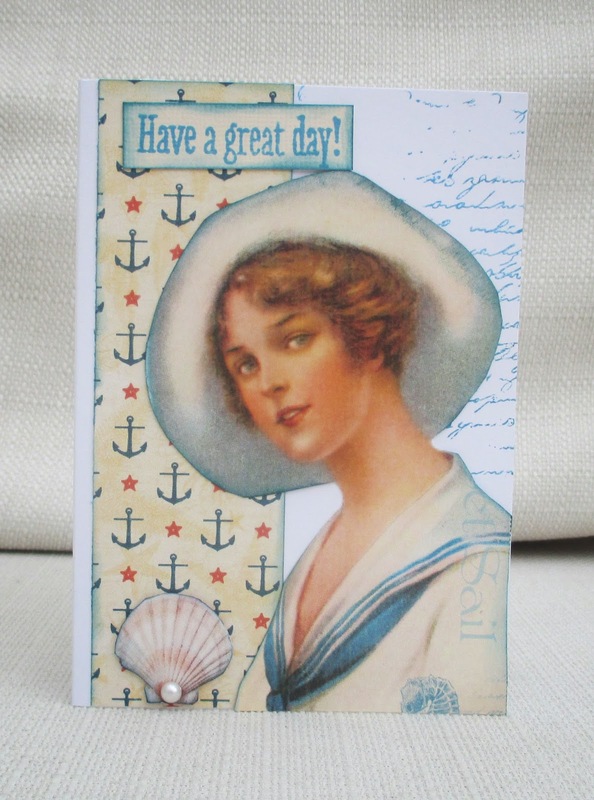 I added a sentiment, pearl and an Indigo Blu script stamp. I had a lovely time at my local crop today, and made this layout using the sketch from Sketchabilities. I used papers from October Afternoon (Woodland Park), some hessian (burlap) and stamps from Stampin Up, Kaisercraft and Cosmo Cricket. This week's challenge at Inkspirational is a word prompt and the word is - 'flight'. I used a photo of a Spitfire plane, and added the words- the first and last lines from the poem 'High Flight' by John Magee. The poet died very young and these words were inscribed on his gravestone. The stamps I used were a grid by Kaisercraft and numbers by 7 gypsies and I added metal cogs, a metal tag and a mini playing card. Please do visit us at Inkspirational to see the different ways our DT has interpreted this challenge and to see our Guest Designer, Cornelia. We'd love you to join in. 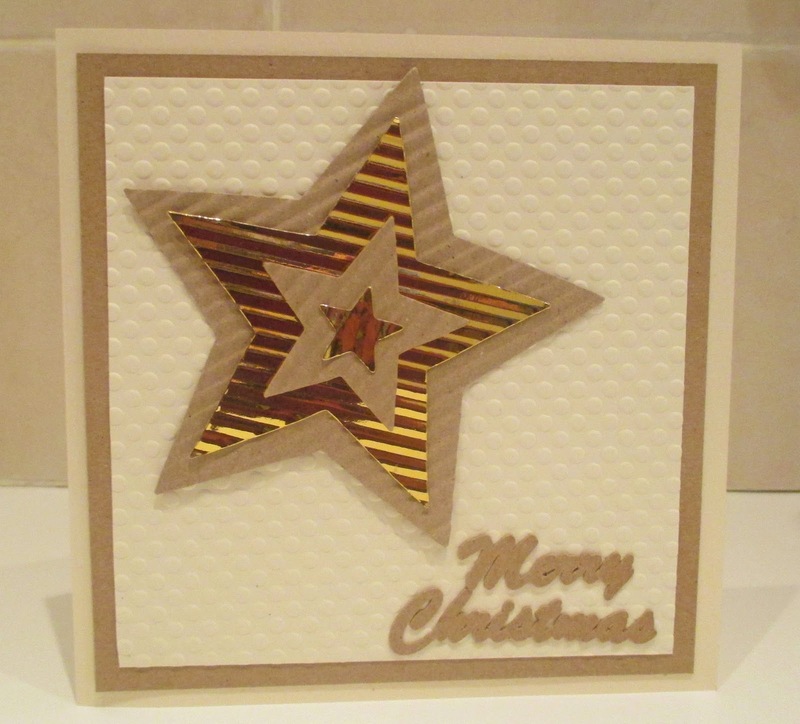 This card has simple shapes and colours but I hope the crimping and dry embossing add interest. (That was the plan, anyway!). 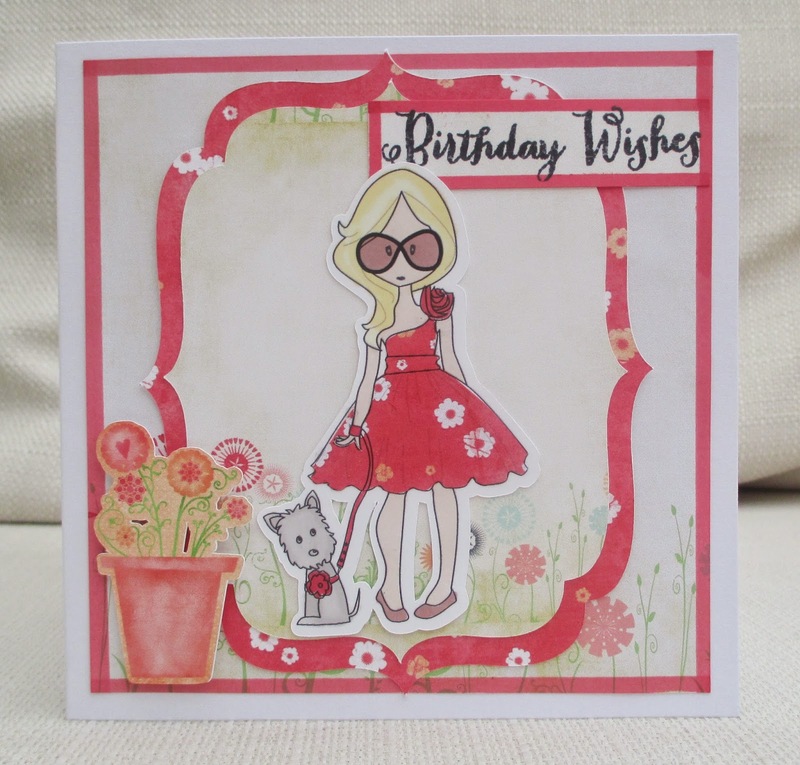 Happy Birthday to my lovely Inkspirational team-mate , Yvonne. I used a flower stamp by Impression Obsession - I stamped it onto a background I made when I was playing around with backgrounds. 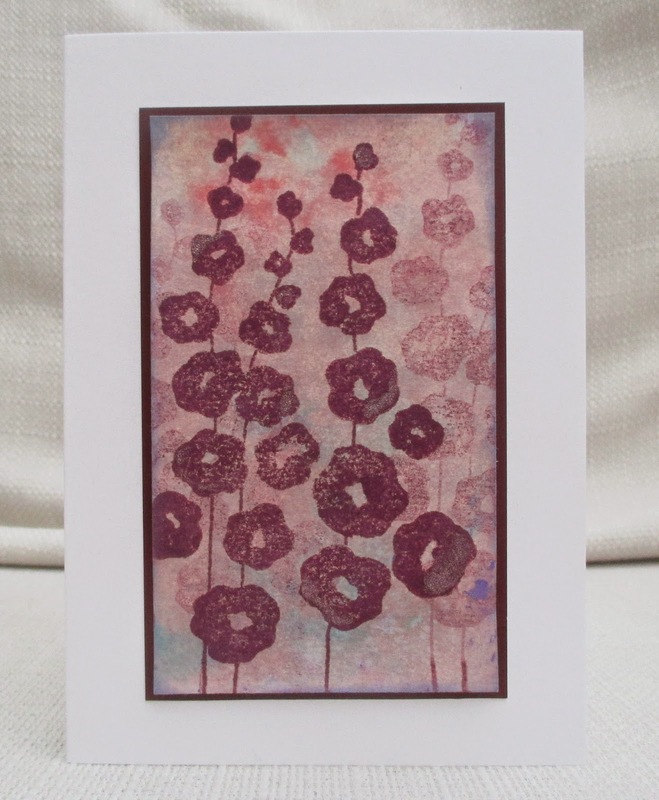 I used 'second generation' stamping to create the impression of more flowers behind (well I hope that's the effect!) . I added a 'Wink of Stella' to some of the petals and kept it unembellished for its transatlantic flight. Great news! I've joined the Design Team at Creative Cutting Challenge and that means I get to play with lots of great SVG (electronic die-cutting) files from the Creative Pointe ! This time, I used 'race car with numbers' and yes, it comes with the full set but I decided to use number four, for my grandson's fourth birthday. Using Silhouette Studio, I made a shaped card and cut out all the pieces. I used a chevron embossing folder and sanded it down. 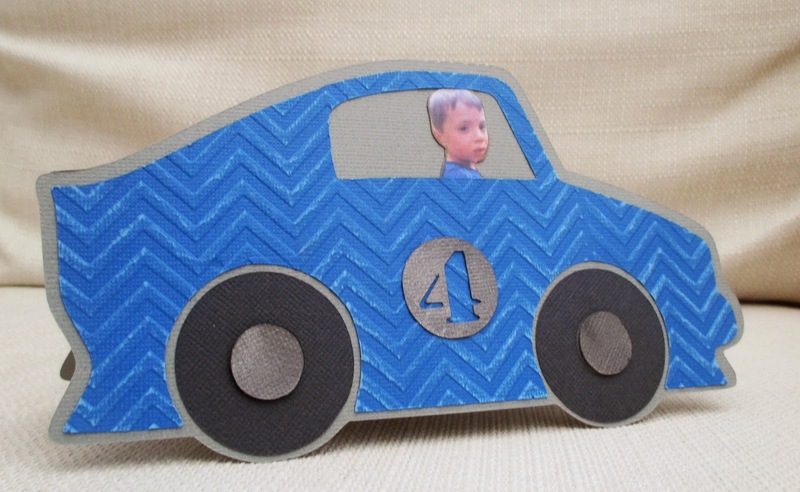 I cut out a photo of my grandson, and put him in the driving seat. 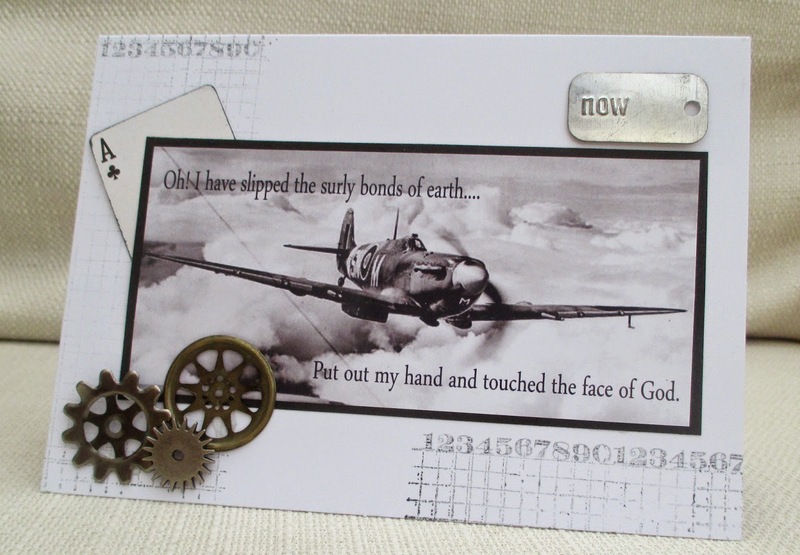 I don't often set out to make a CAS card - if I do one, it's usually by accident! But I do like an oriental theme...and I do like a challenge, so I though I'd have a go at the Addicted to CAS challenge this week. The doll stamp is one of a set of three Hero Arts stamps that is on my 'use it or lose it' pile - that is, if I don't use them, I'll get rid of them! I stamped onto a piece of red vellum and paper-pieced the dress. The text background is an Oyster Stamps large stamp - I masked off the edges of the cards with tape, and used a second generation image for a faded , patchy look ( yes, it's deliberate!). I also used a Sheena Douglass oriental text character, which apparently means 'friend'. City Crafter vellum - okay, so it's a small piece of vellum, so it does stand out! I was feeling a bit uninspired this week, so I reached for this vintage photo I'd previously printed (it was a freebie from Completely Christmas ). I created a 'frame' round the edge with embossing poweder and added a scrap of patterned paper, some die-cuts and sentiment. I got this idea from an Online Card Classes class , although I didn't follow the same techniques etc. 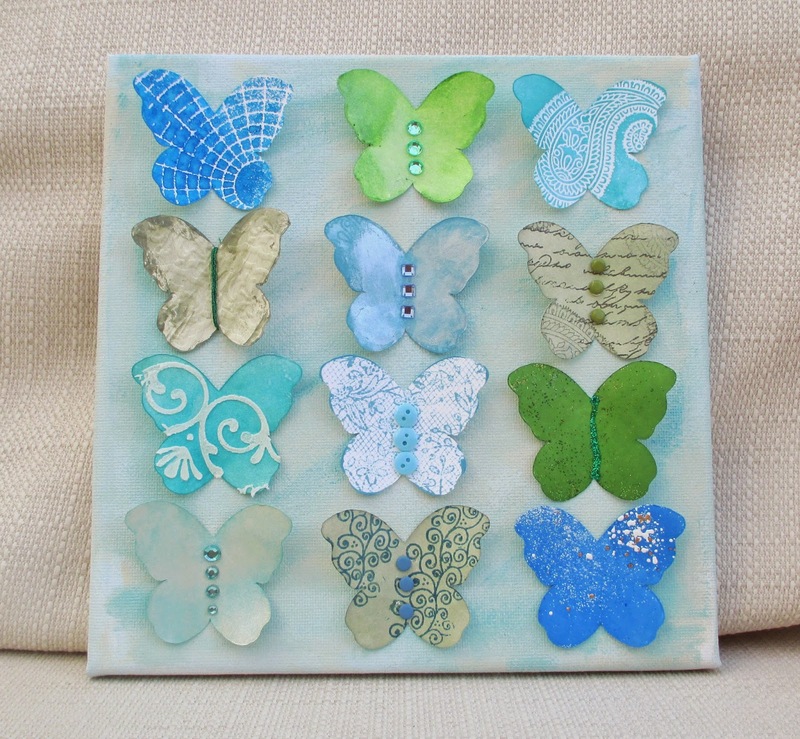 I painted the canvas with Fresco paints and then used different techniques and materials on each butterfly. 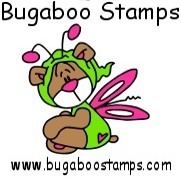 The cupcake stamp was kindly provided by one of our sponsors , Bugaboo, and I paper-pieced it, coloured it with markers and added liquid pearl and glitter. 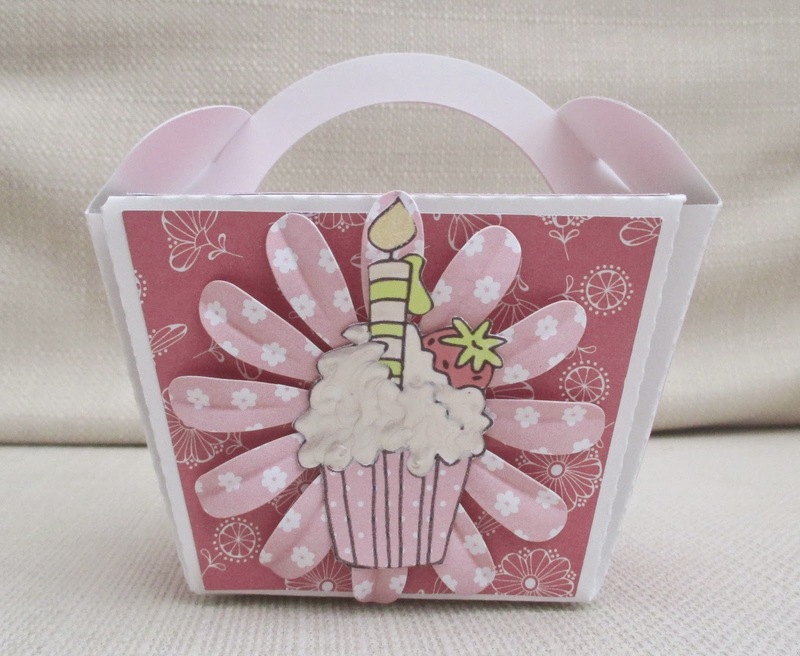 I made the box on my Silhouette Cameo - wouldn't it be lovely to find a cupcake inside? How does the photo inspire you? Come over to Pinspirational and join in. This week's challenge at Make My Monday is Indian Summer - and that means using bright colours. As well as the bright colours, I tried to get an Indian feel to my card (apologies to anyone Indian reading this, for the lack of authenticity!). The elephant stamp is by Paper Parachute (it's an old wood-mounted one) and I stamped it in brown for a henna effect. 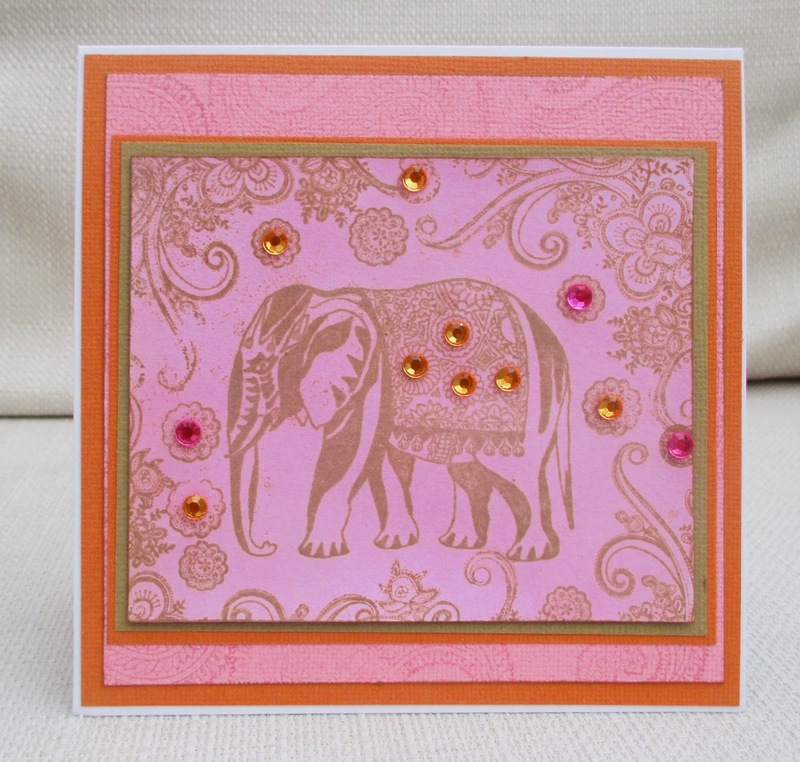 The stamps surrounding the elephant are by Crafty Individuals and the background pink panel is stamped with a paisley stamp by Blade Rubber. I hope you will come over and join in at Make My Monday.